I come to bury Mac not to praise him. Perhaps some praise. What you are looking at was what I did most of this weekend. This is my Mac iBook G3. It was made around 9 years ago and I believe that it is finally just scrap. This machine has been through the mill. It started out as a laptop given to a teacher in a suburban school. That teacher used it for a number of years and then turned it in to their tech support when they were upgraded. Tech support decided that it was surplus some time around 2004 or 2005 and it was given to a friend. The friend had it for a while but had an accident that I'll call "Deceleration Trauma" and that is how I ended up with it. When you upgrade a laptop you have some varying degrees of success. 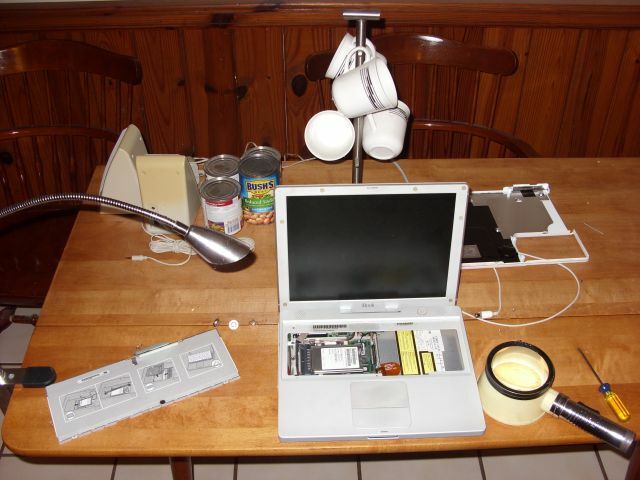 I don't recommend anyone attempt upgrading most components in a Mac laptop. They use a lot of hardware that, while beautiful, is meant to be installed and never upgraded. One Way Yellow Tape to hold down components. My achilles heel with this machine was the cable that powered the hard drive and CD Rom. Mylar with embedded copper wiring is not going to last many cycles of being removed and replaced. While it may sound like I'm bemoaning a fragile machine, it is quite the opposite. This machine was abused. Schools are never gentle to computers. Any laptop that falls off of a table will be damaged, some may not recover. Once the hardware was replaced, this machine performed well enough for me to become one of my favorites. I am a Project Manager. That *requires* extensive knowledge of Microsoft Office, Microsoft Project, Microsoft Access, Microsoft Visio. I've got all of those and know them well. That's work, that little Mac was a playground. I could do things on it and not pretend that I was being productive. It showed me that while I could think like the herd, I can also "Think Different". It also convinced me that the next time I have to shell out for a new off the shelf laptop, the first thing I'll do is look at a Mac Book or what ever they're called at that time. For the mean time, I'll reclaim the hard drive, memory and the Airport card from my little white buddy. I'll also be looking for a new one on Craigslist. It will have to be free, which means it's going to be pretty low end. A G4 would be nice. An Intel Based Mac Book would be perfect. I don't use a desktop machine here, they're just too impractical in this house.